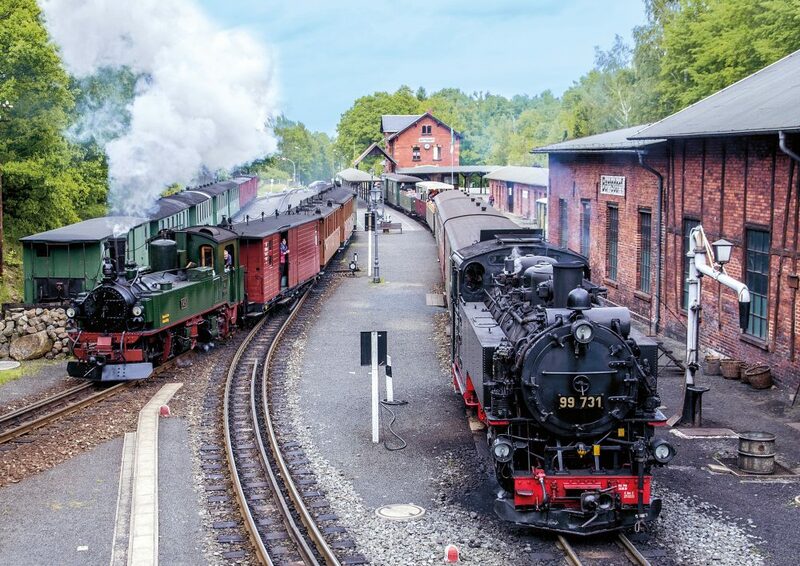 Using standard steam locomotives or Einheitslokomotiven Class Altbau- VII K, we offer our simultaneous departures from Bertsdorf station daily in the high season in collaboration with the Saxon-Upper Lusatian Railway Company (Sächsisch-Oberlausitzer Eisenbahngesellschaft or SOEG). During the high season, trains always have a dining car; while in the low season, there is a dining car from Friday through Sunday (from Monday through Thursday, only upon advance reservation). (picture above) • All steam trains (except the Saxon and Reichsbahn trains) operate open panoramic cars daily from May to October in nice weather. The barrier-free cars provided with hydraulic lifts are operated daily in both regular trains (not in the Saxon train, Reichsbahn train and the railcar).